During the Victorian era, wealthy Buffalo residents celebrated Christmas with spectacular parties and lavish decorations. Get a taste of that bygone era during the Victorian Christmas events at the Theodore Roosevelt Inaugural Site, 641 Delaware Ave., Buffalo. You can still make reservations for events on Thursday and Friday of this week, which include a dinner theater performance by Mike Randall, actor and meteorologist for WKBW-TV, in Charles Dickens Presents: A Christmas Carol. Randall will perform as Dickens, re-creating the author’s 1868 visit to Buffalo, where Dickens read from his works, including A Christmas Carol. The setting for all of these events is the stately Wilcox Mansion, where Theodore Roosevelt took the oath of office and became our 26th president in 1901. The mansion has been decorated for the holidays by members in the Federated Garden Clubs of New York State, Eighth District. 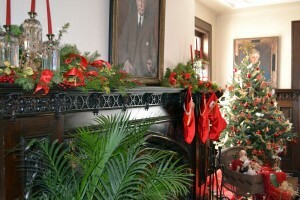 The decorations can be viewed through Dec. 30. The garden clubs were asked to capture the spirit of the turn-of-the-century period, said Lenora M. Henson, curator at the Theodore Roosevelt Inaugural Site. We know how Buffalonians decorated their homes for Christmas because newspapers carried lengthy descriptions of the parties, Henson said. In addition to holding Christmas parties, the wealthy residents also held debutante balls. While it was once thought that people didn’t use poinsettias during this period, those flowers were in fact quite popular, according the newspaper articles. People sometimes used banks of poinsettias in their lavish decorations. Palms were also popular, and can be seen in the photo of the Smallwood Garden Club’s decorations in the photo at the beginning of this story. Natural materials were widely used during this period. 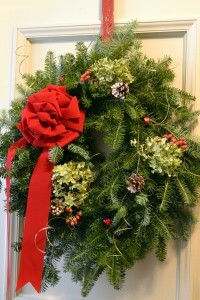 The wreath from the Town and Country Garden Club, above right, is accented by pine cones, berries and dried hydrangeas. 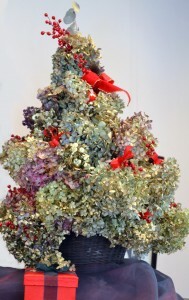 The East Aurora Garden Club used dried hydrangeas to construct a Christmas tree to display atop a piano, seen at left. Christmas cards weren’t common yet, but postcard greetings at Christmastime were inexpensive and very popular. The Forest Stream Garden Club has created a lovely decoration with postcards that you can re-create in your own home with Christmas cards. 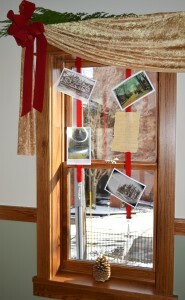 Simply attach the cards to ribbons and hang. The railings of a stairway are laced with evergreens and accented with tussy mussies by the Kenmore Garden Club, below left. The tussy mussies have crocheted holders filled with dried flowers and berries. Tussy mussies were small bouquets that ladies would give to their friends or use as party favors during this period. 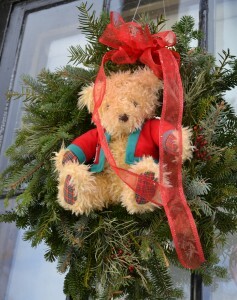 The Ken-Sheriton Garden Club captures the spirit of the times by using a teddy bear in a wreath, below right. The popular toy was actually named for Theodore Roosevelt. The president was on a hunting trip where packs of men using dogs tracked, flushed out and wore down the prey while the hunter just waited for the animal to be driven to him. A bear was tracked, clubbed and tied to a tree, and Roosevelt was called to shoot it. Roosevelt refused to shoot the bear because it was unsportsmanlike. Reporters with the hunting party soon spread news of Roosevelt’s fair play nationwide, and a political cartoon featuring a cute bear became popular. Inspired by the incident, a couple of New York City shop owners made stuffed bears and attached “Teddy’s” name to them, and said they had written to the president for permission to use his name. The teddy bear became a nationwide fad and an enduring pop-culture symbol. Teddy bears, books, toys and Christmas items are available in the museum shop. 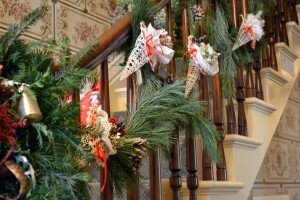 Through Dec. 11, visitors may view the decorations and visit the museum gift shop for a special $5 admission fee. Hours are 10 a.m. to 5 p.m.
A parking shuttle is available from 9 a.m. to 3 p.m. through Friday, Dec. 10 to take you from the Holiday Inn parking lot, 620 Delaware Ave., to the Theodore Roosevelt site. Starting Dec. 12, the museum will return to its normal schedule of guided tours; the museum may be visited by guided tour only. Tours are scheduled every hour on the half-hour, beginning at 9:30 a.m. weekdays and 12:30 p.m. weekends. The last tour is at 3:30 p.m. Group rates are available. Next week we’ll show you more photos and talk about how a coherent look is achieved when the decorations are prepared by 12 different groups. What a surprise to see hydrangeas in the wreath and tree! 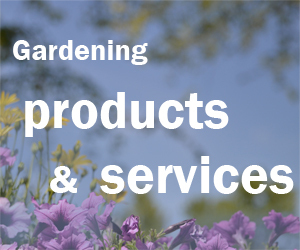 It invites so many other lovely options like dried baby’s breath, red or yellow yarrow or celosia. Thanks for the pique to imagination! That’s what I love about this kind of event– you can get so many new ideas and be spurred on by the creativity of the designs. Thanks for your comment! I love visiting the Theodore National Site during the Christmas season – it really helps me get into the Christmas spirit. The garden clubs do an amazing job decorating and making it feel as if one has just stepped back into that era. I still have fond memories of when I used to be a docent at the Site! 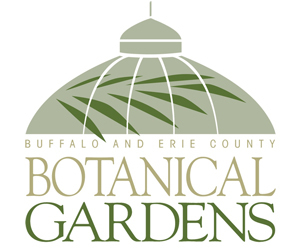 Every Buffalo native should tour the newly renovated Site! The garden clubs have done a beautiful job, and the docents are excellent. After taking the photos and writing the stories for this magazine, I came back with my sisters and a friends. I agree that it’s worth seeing. Thanks, Sally!